Wolves were on their holidays, there's no doubt about that. But usually a Wolves side on their holidays would trounce the worst Sunderland side that has ever existed. Player Ratings: Same Story, Different Day - Different Performance? Sunderland lost again blah blah blah. Sunderland were terrible blah blah blah. The players aren't fit for the shirt blah blah blah. The away fans were fantastic again. Same story, different day and team. Time to vent once more and rate the players. Player Ratings: Were Resilient Sunderland Unlucky at Anfield? Sunderland's brief winning run crashed down against Liverpool today, with Divock Origi and a late James Milner penalty sending the hosts to the top of the Premier League table. Our resistance was finally undone in the 75th minute at Anfield, but how well do you think we really played? Have your say and rate the players below. Player Ratings: Moyes Sees Improvement, Do You? Heartbreaking, devastating and utterly expected. Winston Reid's 94th minute winner kept Sunderland rooted to the foot of the Premier League table as another must-win game ended in defeat at West Ham. Amazingly, David Moyes reckons he can see improvement in this team. Now it's time for your say. Player Ratings: Were You Impressed After Sunderland 1-1 West Brom? 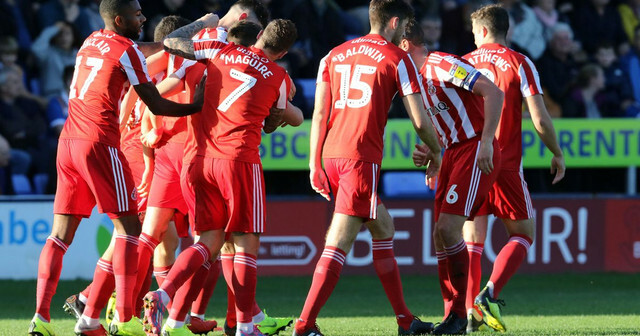 Sunderland's 1-1 draw with West Brom on Saturday afternoon briefly lifted David Moyes' side off the foot of the Premier League table after doubling their points tally. It was far from a convincing performance, with Patrick van Aanholt's late equaliser salvaging an unlikely point. Now it's time to have your say on who impressed, and who isn't helping matters. Player Ratings: Who Were the Real Positives in Defeat? Sunderland lost their first game at the Stadium of Light to Middlesbrough. A spirited second half display was not enough to pave over the lacklustre first meaning Patrick van Aanholt's strike was merely a consolation. Time for you to rate the players! With their Premier League status confirmed midweek, this afternoon's season finale at Vicarage Road was to be nothing more than a 90 minute party for the travelling faithful. Despite Allardyce making nine changes to the team that ran out 3-0 winners over Everton on Wednesday, Sunderland twice took the lead, although questionable decisions from referee Kevin Friend ultimately saw the points shared. So now, for one last time this season, it's time for you to rate the players, including the three youngsters making their Sunderland debut's. It wasn't a dream. Sam Allardyce really has led Sunderland to Premier League survival, at the expense of them up the road. In the cauldron of noise that was the Stadium of Light last night Sunderland blew away Everton to comfortably win 3-0, with the game, and the relegation battle, over as soon as Patrick van Aanholt's free kick wrong footed Joel Robles. Now, for all those too hungover to make it to work this morning, it's time to rate the players from the performance of the season. I think this might be a close one!